I finally had the time to publish my French methods on the Amazon website. As a teacher, my main valuable skill is teaching and share knowledge, but when it comes to publish books I needed to know a bit about editing and design. The process itself is fun, but I spend time because I am not used to it. Of course, the more I will publish, the more I will do this quickly. I really think books and methods are handful to get a reference of what you need to know for a certain subject. You can refer to it every time you need it and if you have a paperback version you can even write on it and highlight what you feel relevant in your studying journey. Of course, these materials go hand in hand with a tutor or classes that can give you proper guidance. If you are an advanced student, you can use them on your own though. Most of my student ask for my help to take this French test. 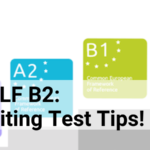 This method gathers all the knowledge you need to succeed in this part of the DELF B2 test. It explains what you need to do, and gives you examples as so as exercises to get more confident. I strongly suggest to train with a tutor along, so that you can have the right feedback on what you are doing, and you can practice a lot with the simulation of the speaking test. These are the first two French methods, if I have time, I have more to publish especially about idioms and vocabulary. If you already bought one of the above method on my site, or if you plan to buy it on Amazon, please give a review, so that it will help other students to make a choice. My Method DELF B2 Speaking Test – How To Succeed is available! What Is the DELF B2?